We grow our vines on four acres in the heart of the Green Valley sub-appellation of Russian River AVA. After years of selling our grapes to wineries, our dream came true with the production of our first vintage of O'Connor Vineyard Pinot Noir in 2005, always sourced exclusively from our four acres, which are planted on Pommard, 115 and 777 clones, and aged over 12 months in French oak barrels. With the advent of our son-in-law Ron Johnson as winemaker in 2013 we have come full-circle as a family-owned vineyard and wine. The fruit from our vineyard embodies the traits of the Green Valley sub-appellation of the Russian River Valley AVA, one of the world's finest growing regions for Pinot Noir grapes. The small grapes consistently produce a deep, ruby color and intense fruit flavors of cherry, blackberry, and pomegranate balanced by smooth acidity and structure and a welcome note of spice. A lover of history and good conversation, Jim was a voracious reader and always enjoyed their many gatherings with friends, from Foothill Park Sunday bbqs in the 1970s to more recent gatherings with Sonoma County friends, and the surprising fun of social wine tastings with new friends at the vineyard in the 2010s. Jim never missed the chance to tell a good joke and enjoyed speaking Spanish right up until the end. Jim also loved the great outdoors, taking his family on camping trips throughout the entire western US from Alaska to Baja, Hawaii and the southwest. More recently, he loved to enjoy the views around him in the beautiful Russian River region. A true Renaissance man, he loved to sketch buildings, could fix anything, deeply enjoyed music, especially by Bach and Irish folk musicians, and would pick out a tune on any piano he walked by. He leaves a giant hole in our family and a pair of very large shoes to fill, and will be missed greatly by his wife and partner by his side for 50 years, Mary, and by his daughter Sara (Ron) Johnson and grandchildren Daniel and Abigail, and his extended family and many friends. With his great smile, quick wit, generosity, compassion and warmth, we believe he has a first class ticket to heaven and is keeping an eye on the vineyards from above. Rest in peace. "From longtime growers based in the Green Valley, this is focused, site-specific wine-making at its finest, an exploration of forested pine and airtight acidity that buzzes on the palate with electricity and freshness. Tannin play a supportive, silky and unobtrusive role, allowing room for plum and dark cherry to speak." "Moderately light cherry red color in the glass. Soaring aromas of Bing cherry, spice, toast and tobacco lead to a middleweight styled wine with delicious dark cherry fruit. The charge of fruit is buffered by vibrant acidity and silky tannins. There is definite barrel influence, but it seasons rather than dominates the wine. Very enjoyable, with a smooth texture and an exit bursting with savory oak and black cherry goodness. A real charmer and quintessential Russian River Valley in character at a very reasonable price. Score: 93." 414 cases. 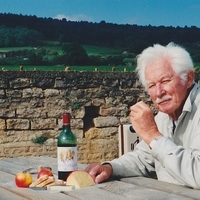 Ron Johnson, winemaker. Pommard, 115 and 777 clones. 14.2% alc., pH 3.52, TA 0.66. Harvest Brix 25.2º. Aged 18 months in French oak barrels. "A small-production wine from longtime growers, this is light and herbal, integrated in wood and tannin. It's vibrant and fresh on the palate and nose in plum and wild strawberry. High in gentle acidity, it provides a note of black tea and earthy truffle on the finish. Drink now through 2021." "Moderately light cherry red color in the glass. Lovely aromas of Bing cherry, baking and wood spices and sandalwood.The cherry cola essence charges out of the bottle initially in a light to mid weight style wine that is fresh and juicy. There is noticeable but not imposing oak infusion and the gentle tannins in the background provide adequate structure. This wine has a classic Russian River Valley profile in a more feminine style. Score: 90." 340 cases. Ron Johnson, winemaker. the purchase of a case. to orders shipped outside of California. We accept payment by PayPal or check. Join our mailing list to receive information abouut special offers and new releases.